Top Connected Car Companies [2018 Edition] - Ignite Ltd. The Age of Connected Car began in 1996 with General Motors’ introduction of Onstar, the first wireless, in-car driver assistance system. Twenty-one years following Onstar’s groundbreaking release, we are seeing a literal metamorphosis of the auto industry. As “automotive companies” become “connected car technology companies,” the car industry as we know it is rapidly reinventing itself from the inside out. Connected car will spur innovation and growth among automotive and non-automotive industries alike. For companies willing to invest in the automotive industry of the future, payback could be huge. By 2020, analysts project the global connected car industry to be a $141 billion market. Not surprising, there is no shortage of companies choosing to come along for the ride. Market opportunities exist for both automotive OEM and aftermarket vendors, for hardware and software products, and for infrastructure technology providers. This article will help reveal the enormous scope of the emerging connected car industry by taking a look at top connected car companies and 3rd-party actors pushing development. As connected car technology brands begin to surface, we can expect fierce competition. And competition, as we know, only helps to advance an industry even further. In the newly-emerging connected car industry, new terms seem to appear daily. And the very definition of those terms can vary, depending on who’s using them. In composing a list of connected car companies, the distinction between connected car and mobility is obscure, but important. Connected car, by strict definition, includes vehicles with Internet connections. Products and services in the “mobility” niche can more broadly include automotive-related mobile apps that do not necessarily “connect” to the vehicle systems. For purposes of our article, we tried to focus on companies that provide products or services that connect to the connected vehicle, or which connect to the connected car infrastructure. Thus, the large number of stand-alone mobile apps and hardware devices are not included. The connected car ecosystem is a multifaceted industry, with thousands of 3rd party and aftermarket companies involved. While no article can include them all, we believe what you will see here is a fair representation of the connected car landscape. The field is wide open for apps and cloud-based platforms that help drivers to locate available parking. As parking lot management systems begin interacting directly with connected cars — and especially with autonomous vehicles, we will see an evolution of platforms with automated features yet unimagined. The connected car industry has opened a huge new market for mobile apps. There is growing demand for apps that interface with a vehicle’s infotainment and telematics systems, and for apps that run on OEM platforms. Vehicle diagnostics, roadside assistance, mobile WiFi, automatic accident messaging, driving skill coaching, parked vehicle location, enhanced GPS features, onboard hotspots, maintenance management, traffic advisement, and trip planning form the core focus of connected car app companies. Connected car technology provides the platform for even more automotive advancements, such as self-driving automobiles. Autonomous vehicles represent the highest level of connected car technology, with various levels of automation, from no automation to full automation. At the forefront of the connected vehicle industry are automobile manufacturers. Far from taking a unified approach to connectivity, each automaker is seeking its own path onto the connected car technology highway. The explosive growth of the connected car ecosystem will require fast and robust storage, which only connected cloud platforms can provide. A connected vehicle is capable of sending more than 25 gigabytes of data into the cloud every hour — probably a lot more. The challenge of processing automotive big data is being met by these technology giants. Early adopters of connected car technology, fleet management companies provide a ready-made niche market for connected car technology providers. Connected trucks represent a new opportunity and new challenges for the auto industry, both for truck makers and technology companies that power them. Some companies create products and services for the connected car industry, and some provide the platforms needed for product development. Modern vehicles require complex test equipment to even read trouble codes through the OBD II connection. And while many makes require service to be performed at the dealership, vehicle owners and independent mechanics are demanding equal access to vehicle diagnostics trouble codes. The demand for both professional and consumer-level diagnostics has created a niche industry in connected vehicle diagnostics. Digital cockpit does not merely refer to the highly-digitized passenger compartment or instrument cluster of a connected vehicle. Rather, it describes products that combine infotainment, head-up displays, GPS, and other non-related features into a single driver-accessible platform. Infotainment systems deliver information and entertainment within the vehicle. As the primary interface between drivers, passengers, and the vehicle’s Internet connection, features sets are rapidly expanding. Just as the connected car industry is rapidly advancing, so, too, is the hybrid and electric car industry. Despite slower growth expectations, makers of electric vehicles wish to capitalize on connected car technology for their vehicles. Service management software aids manufacturers and service providers in managing service programs and over the air (OTA) software updates. Connected car service management platforms take advantage of the full power of IoT technology. Head-up displays (HUD) have been around for some time, placing the time of day and vehicle speed directly into the driver’s line of sight as they view the road ahead. Through the power of IoT, HUDs can now display additional information such as fuel levels, news and weather alerts, and even email messaging. Connected vehicles include highly complex internal networks. Providing products to power or interface with these networks is a burgeoning industry. Insurance companies are increasingly using the power of IoT to change how they assess driver risks. By tracking driver behavior through connected technology, insurance companies reduce their risk exposure, and can reduce premiums for customers who drive responsibly. IoT encompases sensors, devices, systems, and infrastructure that allow inherently non-computerized “things” to communicate using the Internet. IoT products and services form the core of connected car technology. A connected vehicle is made up of IoT devices, and is, itself, an IoT device. Below, we cite companies that provide IoT components and services for the connected car industry. Advanced navigation products demand advanced mapping technologies. Companies like these are already charting the course. Microelectromechanical systems merge nano-scale mechanical devices with microelectronics to form advanced sensors. 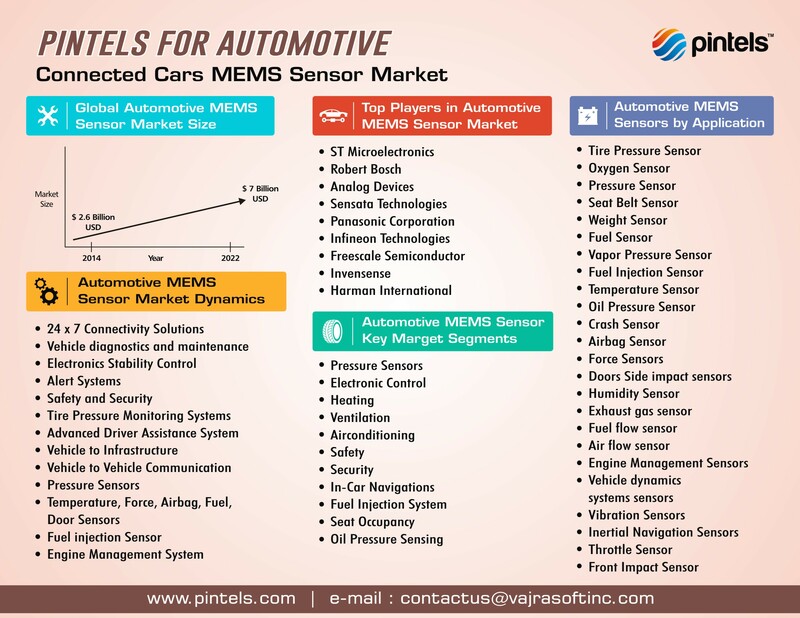 MEMS are used extensively in automotive industry, with connected car technology broadening the market. J.P. Morgan estimates that the market for semiconductors used in semi-autonomous and fully autonomous vehicles will reach $7.3 billion by 2025. Microprocessors optimized for connected car will make up a significant portion of that market. Just as companies have risen to the need for specialized apps for the connected car industry, the convenience of multi-function apps is also enticing app providers to enter the market. Connected car technology provides new ways to keep vehicles safe. Through the power of connected telematics, crash detection, drive assisted safety features, and data from external IoT infrastructure, technology companies are already improving the safety of your next road trip. The greatest challenge to the growth of the connected vehicle industry is the threat of cyber attacks. Meeting the challenge are companies, large and small, that develop connected car cybersecurity solutions. Connected car technology is not limited to vehicles. Connected cars will increasingly connect to the IoT infrastructure of smart, connected cities. A growing list of companies are already building the ecosystem to support this emerging market. The computers and IoT devices of modern vehicles process over 100 million lines of code. The software-driven, connected automotive industry will require 3rd-party innovative solutions for OEM and aftermarket products. Mobile software outsourcing providers are meeting the challenges with powerful, cost-effective solutions. Automotive telematics monitor vehicle systems. IoT technology now makes it possible to share this information with in-car applications, service providers, and even other vehicles. Market opportunity is driving a growing list of companies into the telematics space. Connected vehicles not only communicate with service providers, they communicate with each other. Vehicle-to-Vehicle (V2V) and vehicle-to-infrastructure (VTI) networks enable them to do both. Major communications companies are building the networks that vehicles will use to connect with the world around them. WiFi hotspots are needed everywhere people go, including in their vehicles. Meeting the need are these reliable companies. The era of automobiles as we know them is coming to a close. The future of the automotive industry belongs to smart cars and the technology that connects them to the outside world. Soon, the connected and automated features of high-end models will soon be as commonplace as the car radio. Between now and then, there are challenges that must be overcome. Meeting the needs of this brave, new industry will be thousands of companies, old and new. While we listed a few of them, here, many more are working equally hard to shape the future of the connected car industry.